The making of tea whisks began in the middle of the Muromachi period (1333-1568), when the younger son of the lord of Takayama was asked to make a whisk by Murata Juko, who had been instrumental in perfecting the tea ceremony. Thereafter, the production method was kept a guarded secret by the lord of the castle and his family and was carefully handed down from generation to generation. However, sometime later the secret was revealed to sixteen of the family's chief retainers and the techniques were passed on without interruption. 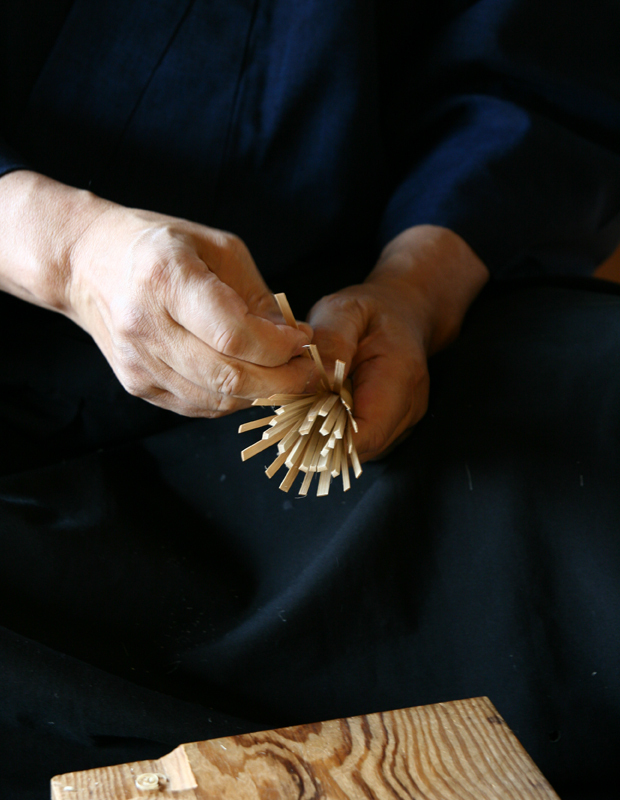 Takayama is now the only place in the country where tea whisks are being made. 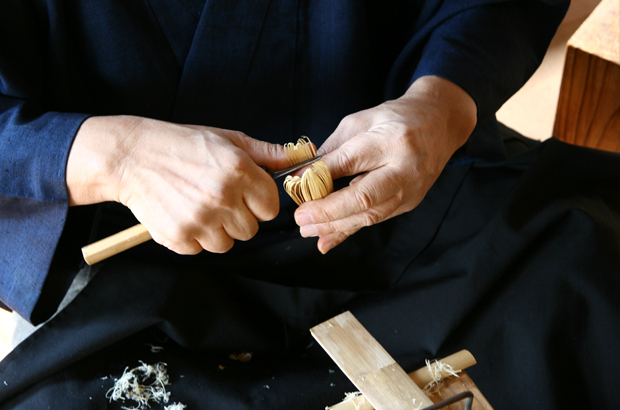 There are about 120 different kinds of Takayama Chasen, the type of material, shape and number of splines varying according to the school of tea, and also on the kind of tea, whether it is weak or strong, to be served in very formal surroundings or at an open air tea ceremony, or if the whisk is for a travelling set. The taste of the tea is also said to differ slightly according to the workmanship during the whittling process. A part from the traditional whisks, some are now made for decorative purposes, while others are made to produce a good head of froth on milky coffee. The typical bamboo considered good for chasen is said to be that from the mountains of Hyogo, Nare, Kyoto and other areas on the Pacific Ocean side of the Kinki region. This is because this area is low in nutrients causing the bamboo to grow strong and sturdy. The craftsman then takes the piece of bamboo and divides it into sixteen pieces, they’re then cut into large and small segments to make the number of tines required. The ends of the tines are boiled in hot water and placed on a stand, then thinned from the base to the tip. After carving, the bristles are tapered to create a brush-shape, smoothing out all the rough edges and then finish it off by fixing the base securely with thread. You don't actually "whisk" the tea with them the way you would egg whites; you move it in a "m" motion instead in the tea bowl. To clean, rinse then dry before storing. You can buy stands (referred to as "forms") that you put them on to dry to help them retain their shape longer. We recommend that you get the bamboo whisk wet just before you use it. The bamboo whisk is susceptible to dry conditions. When it is dry, it becomes brittle and easy to break. It is better to store the bamboo whisk on a whisk keeper after using it. This will help the whisk to retain its shape.